Receive our Agendas and Notifications! NEED HELP WITH CITY SERVICES? Please arrive 15 minutes early. Plenty of parking will be available. “Stop the Bleed” is a national initiative designed to provide bystanders with the tools and knowledge to stop life-threatening bleeding. Fire Station 82 Annex, 1800 N. Bronson Ave. Please click on the links below for Agendas, locations and the most accurate, up-to-date detail, which are subject to change. Agendas are posted a minimum of 72 hours prior to the meeting. Meeting Days, Dates and Times may be cancelled/rescheduled due to Holidays or other events. Curious about what projects are currently planned for Hollywood? So are we! Thanks to Urbanize L.A, we now can find out. Justclick on the link below. 1. Create a more livable community by establishing an open line of communication between the HUNC and City Government. 2. Provide an open forum for discussion and information sharing through which all members of the HUNC may involve themselves in the affairs of the community. 3. Enhance stakeholder pride and responsibility by promoting participation in the decision-making process. 4. Be an advocacy group for issues which command broad community support. 5. Work with the City and other neighborhoods to find solutions to common problems. 6. Promote the well-being of each and every neighborhood within its boundaries. 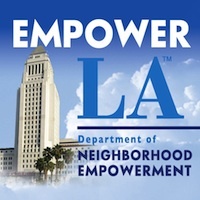 The Hollywood United Neighborhood Council is established in accordance with the authorized plan of the Department of Neighborhood Empowerment of Los Angeles and complies with Federal, State and City laws. All Hollywood United Neighborhood Council meetings are open to the public. Please feel free to get involved, help with outreach, run for the Board and build your community. Neighborhood Councils are City-Certified bodies made up of elected volunteers from a variety of walks of life (nonprofits, businesses, schools, homeowners associations, etc.) to meet and advise on issues of local concern such as education, traffic, public safety, and infrastructure. Sign up for the City of Los Angeles Early Notification System and get City Agendas. Includes other Street Closures when available.